The baby shrug is finished at last. 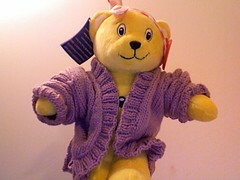 It doesn't really fit Pudsey bear but that's irrelevant because he won't be the one who has to wear it! The shrug will shortly be united with its new owner, a baby named Georgina. That is a gorgeous shrug,lovely colour.